One Theme Park At A Time is delighted to bring you to one of the two outdoor Wanda theme parks that are currently operating, Hefei Wanda Theme Park. Opened at the end of September 2016, the park is only 4 months younger to its predecessor, Nanchang Wanda Park. Located in the city of Hefei in Anhui province, Hefei Wanda Theme Park can be reached from the metropolitan city of Shanghai by high-speed train - approximately 3-3.5 hours away. The entry path leads to an impressive hub lake where visitors get a nice view of the park's centrepiece monument and roller coaster. To get to Hefei Wanda Theme Park, you want to get yourself to the city of Hefei first. The most convenient way would be to take a high-speed // bullet train that stops at the city's high-speed railway station, Hefei South Railway Station. Once you reach the station, take the Hefei Metro Line 1 heading for Jiulianwei. Contrary to its name, alight at the Wannianbu stop instead of the Wanda City stop. It's much closer to the main entrance of the theme park. Once at Wannianbu, take Exit A. The entrance is just 2 minutes walk away. One-way metro ride should cost you CNY 3. Hefei Wanda Theme Park is located 10 metro stops away from Hefei South Railway Station. One-day tickets for Hefei Wanda Theme Park are CNY 248 for adults and CNY 185 for children which if you compare to those of Shanghai Disneyland are rather cheap. If you're a student based in China, don't forget to bring your student card or passport to prove your student status. I showed the staff my school ID card and managed to get a child price (CNY 63 discount can get you 3 full meals in Shanghai, you know). The entry avenue of the park is packed with food stalls selling local delicacies and souvenirs. Hefei Wanda Theme Park is distinctly an urban theme park. The sprawling high-rise buildings and the neighbouring Wanda Shopping Mall is visible from the middle of the park. The first impression that I got from the park, unfortunately, is that the park is not immersive enough for me to wholly enjoy the storytelling aspect of the park, which I will talk about later. Nevertheless, the theme park is actually far superior to other Chinese theme park that I recently visited, Happy Valley Shanghai. This is particularly visible once I reached the hub lake, which gave me an impressive view of the iconic monument and roller coaster of the park. Even just by looking at the iconic dragon monument, I knew right away that this theme park is doing serious efforts in telling stories that engage the visitors, much more so than local players. Other than providing a spectacular panoramic view, the hub lake also provides pleasant seating areas for visitors to enjoy. Operation-wise, the park performed much better than my expectation. I never queued more than 40 minutes for any rides, despite the park being decently crowded and that the (notably) roller coasters operated only one single train. Attraction hosts proactively did their best efforts to fill every single seat on the rides by asking for any volunteer single riders. Additionally, the safety check was done efficiently with the staffs attending each rider at good speed. This makes the operation at Happy Valley Shanghai sub-par. I also love the fact that the park applies extremely long cycle on all of its flat rides. For example, the Disk-O attraction here has a cycle of close to 5 minutes, which is much longer than the typical 2-3 minutes in other similar parks like - say - Happy Valley Shanghai. So now you know that whenever you're on a flat ride at a Wanda park, you'll have double the pleasure. Wanda's attention to detail is even apparent on the rides. Notice the well-themed trains on Soaring with Dragon. Generally, the park is well-themed. For Chinese standard, I feel that Wanda did a magnificent job in pushing the bar for local theme park players. Each themed area is filled with structures, buildings, and ornaments that are detailed, artistic, and unique. Living up to the original vision of the park to bring the local culture to life, I can't help but to be curious about Anhui heritage during and after my visit to the theme park. For Chinese standard, Hefei Wanda Theme Park's storytelling is superior thanks to its detailed production design. Some of the park's rides are incredibly themed. While the theming of the park is generally superior, this unfortunately applies only to the exterior parts. Once I go into each building, the environment just doesn't support the quality that is outside. The storytelling abruptly ends once guests enter each scenery. Because the storytelling is constantly disrupted in similar ways throughout the park, this is one major area where Hefei Wanda Theme Park suffers the most: it's not immersive enough. For example, what looks like a beautiful fortress outside is apparently a game // arcade area where guests attempt to get gift dolls from the game machines. Inside, it's an entirely different tale: no storytelling whatsoever. While the park is often promoted for covering approximately 90 hectares, this is untrue. In fact, the 90 hectares is the area of the entire Hefei Wanda Cultural Tourism City, which includes the theme park, the shopping mall, the business district, the residential area, as well as the indoor movie park. While I'm unsure of the exact size, Hefei Wanda Theme Park's size is comparable to that of Phantasialand or Efteling. In general, it's not too big and not too small, making access relatively easy and enjoyable. Hefei Wanda Theme Park is easily accessible. For its size, Hefei Wanda Theme Park offers worthy amount of attractions for guests to enjoy ranging from kids attractions to those exclusively for adrenaline junkies. I specifically came to this park to experience two (three if you count them literally one-by-one), roller coasters that are unlike any other worldwide - yes, you heard that right: WORLDWIDE. The first attraction that I sprinted immediately to was Soaring with Dragon, a first-of-its-kind Intamin roller coaster that launches riders not once, not twice, but three times in a forward-backward-forward motion. Thanks to the smart use of transfer // switch track immediately after the station, the roller coaster is able to operate up to 3 trains at a time instead of a single one like any other similar roller coasters, increasing capacity to up to 1,300 riders/hour. Soaring with Dragon is the park's signature attraction. With a top height of 196.8 feet and a top speed of 77.7 mph, Soaring with Dragon is a roller coaster that shouldn't be taken lightly by coaster enthusiasts around the world. Moreover, this is probably the only Intamin roller coaster of its kind that have an entire, complete circuit rather than shuttle layout. The length of the roller coaster is ~4,200 feet, which if you really think of is amazing for a theme park like this. I was excited about this roller coaster because of two things: (1) backward launch and (2) non-inverting vertical loop. Both are elements that I had not experienced before, so I was looking very forward to experiencing them for the first time. Soaring with Dragon's trains use restraints that are reminiscent to those of Taron at Phantasialand. Once on the trains, riders simply pull the restraints down from above their head. The restraints rest solely on the riders thighs without any coverage on the riders' shoulders. This creates an extremely "open" and vulnerable sensation to the riders throughout the ride. One of the best things about Soaring with Dragon is its restraints: comfortable yet vulnerable. Once cleared for a go, the train moves out of the station and stops at the beginning of the launch track after the transfer track. Once the right track piece on the transfer portion is in place, the train immediately lurches forward to the non-inverting loop. The train then falls backward and experiences its second launch (backward), sending the train up a 200-feet vertical tower. The train goes down forward at full speed, where the third launch sends riders to the top of the non-inverting loop. So here's what I have to say about the launch... rather than it being forceful and intense like those of Top Thrill Dragster or Kingda Ka, Soaring with Dragon's launches are relatively relaxed and leave some room for riders to breathe. Comparable launches can be found on Taron (again!) and Cheetah Hunt. Still, the restraints and the vertical drop after the backward launch make all the differences in terms of experience. These elements make the first part of the roller coaster very exciting. The first half of Soaring with Dragon as seen from the ferris wheel. The next element is arguably the highlight of the coaster: the non-inverting loop. At 187 feet tall, this is the WORLD'S TALLEST NON-INVERTING LOOP, surpassing the record previously held by Flying Aces (170.6 feet tall) at Ferrari World in Abu Dhabi, UAE. The non-inverting loop is so huge it looks insane. If there's one thing that hinder people from riding this roller coaster for the first time, this would be the one element that scares them. While it looks insane, my experience spoke otherwise. I was utterly disappointed by how forceless and slow the experience was at the top of the loop. It's so slow that I felt as if I was riding Big Thunder Mountain Railroad, which - if you know - is a family roller coaster that has a top speed of merely 28 mph. Adding salt to the injuries, there was no airtime - not even a floater - and the drop back down was just okay. The vertical drop at the beginning was much better. Standing at 187 feet tall, the non-inverting loop on Soaring with Dragon is the world's tallest. Following the non-inverting loop is an inside top hat, which sends the riders upside down before proceeding to the next part of the roller coaster. While - again - it looks impressive, the experience wasn't that spectacular. It was good, but not great, because the train slows down a bit too much at the top of the element, making the inversion feels more like a slow over-banked turn. The rest of the ride is all about speed as it goes up and down small bumps and smooth turns. Throughout this portion, the riders are rewarded with nice views of the park. The portion over the hub lake is particularly amazing as the train circles the symbolic dragon statue. The rest of Soaring with Dragon's layout takes the riders around the symbol of the park, the dragon monument. Unfortunately, that is where the highlights of Soaring with Dragon ends. It's such a shame that a roller coaster that is well-themed, innovative in concept, and becomes the signature attraction of the park comes out as rather disappointing. I was expecting to be blown away just like when I rode Taron, but that was not the case. It's surely a huge coaster, but the experience is anything but. In general, I enjoyed my Soaring with Dragon experience, but unfortunately it doesn't live up to my expectation. I expected to be blown away, but ended up being disappointed by the rather forceless experience. Regardless, Soaring with Dragon remains the signature attraction of the park and - as such - must be experienced when you're at the park. 8.5/10. Battle of Jungle King is one of those roller coasters - no, actually two - where people come to a halt, stand still, and look up in awe as soon as they encounter it... and it's no wonder why. The fortress surrounding Battle of Jungle King creates a magnificent backdrop for a photo. First, there's the fact that Battle of Jungle King is a tilt coaster, which is extremely rare in the world. In fact, there is only ONE other tilt coaster currently operating worldwide named Gravity Max in Taiwan. Second, there's the fact that Battle of Jungle King is not one single roller coaster. It's actually two different roller coaster that are supposedly cycling at the same time. It's duelling tilt coaster, a crazy idea that I thought I'd never witness in my life. Battle of Jungle King's execution of duelling roller coaster proves to be effective visually. With the two tilt tracks facing each other before each goes through its own layout, the roller coasters give the illusion of truly battling against each other. Passer-bys who happen to look at the occurring event for the first time would immediately think that the two trains are about to crash against each other and scream in horror. The interlocking layout of the roller coasters creates exciting experience. As expected, the main highlight of this set of roller coasters is the tilt itself. After the train goes up the normal clanking lift hill, it then completes a complete turn and then stops at the tilt track. The moment the track tilts is unbelievable: you feel as if your roller coaster is falling apart slowly as the track leans further down. Once the tilt track locks in place, the attraction staffs play around with the riders from the station using on-ride speakers, saying things such as, "Three... two... one...," or something else in Chinese. The lock is then released and the train lurches down at full-speed... and the rest is history. I understand if you want to ride these coasters for the sake of getting the credits and to experience tilt coasters if you've never done it yourselves. But - oh my - these coasters are so rough! Once you go on that first drop, your head will bang side-to-side non-stop until the train hits the brakes. To describe it, imagine yourself riding a Vekoma SLC and multiply the banging by two. It doesn't help that the restraints used in these coasters are extremely hard and sturdy. There's no way avoiding your head from banging into these restraints because they're extremely thick. Battle of Jungle King's double restraints system: shoulder belts and sturdy over-the-shoulder restraints. The most painful parts of the ride is surprisingly not the loops. No. It's the sort-of double corkscrews // corkscrews towards the end of the ride that really kill the enjoyment of the supposedly acceptable ride. On the Dragon side of the roller coaster, riders go through a "double corkscrew" element that is non-traditional: the turn transforms immediately into downward corkscrew which - while looks spectacular - is painful in execution. The Tiger side, which has the more traditional single corkscrew, is much more tolerable. Battle of Jungle King is a set of roller coasters that is unlike any other on this planet. Not only they're duelling roller coasters, they're both tilt coasters. Unfortunately, that was where the spectacle ends. The experience is too rough and painful to grant both of these coasters second rides - or chances. If you're at the park, ride them once each side and leave the rest of the day to heal your pain. 5.5/10. Battle of Jungle King is extremely painful especially after the loops. Up until the day of my visit, I had never encountered a theme park in which a live entertainment attraction could be the main highlight of my day. Hefei Wanda Theme Park changed that with a live show - by a Chinese name that I didn't know how to read - performed in an equally impressive large-capacity theatre that is able to accommodate north of 1,000 guests at a time. The show supposedly recounts the story of a battle recurring between two kingdoms. For the sake of clarity, let's call each one the red kingdom and the blue kingdom - pardon my simple take as I didn't understand the Chinese narrative of the show. The blue kingdom kidnaps the red kingdom's wife. The red kingdom gets angry, and battle ensues. In the end, the wife is dead, the blue kingdom is dead, the red kingdom is alive. So I assume the red kingdom wins. The end. The Feishui Theatre houses the magnificent battle show at Hefei Wanda Theme Park. Using water jets to accentuate the climax points of the show, as well as stunt actors and live animals, the show is without doubt the best attraction at the park. The set built for the performance is incredible and - as expected from the park - MASSIVE. From the physical fortress to the massive gate opening and closing throughout the entire show, and even a physical waterfall to the side, this is a show that brings forward its climactic points in colossal scale. The water jets brings plenty of surprises throughout the entire show as the two kingdoms battle against each other. The fights are beautifully choreographed, similar to those you see in Chinese war movies. Also used in the show are the stunt actors and live animals, which further add to the ambience of the show. One thing that is notably mission is the "live performance" of the actors. Having a show at this scale, I'm rather disappointed with the lack of real dialogue from the actors. The show only utilizes music and accentuated physical movements of the actors, hence making it difficult for me to follow the storyline. Adding salt to the wound, I don't understand Chinese, so that's my own fault. The entire physical set of the show is massive in scale. Regardless, the show remains the best attraction in the park personally. Not only it contains one of the most mesmerizing physical design I've encountered in a non-Disney theme park, but the use of water jets and live animals is executed beautifully. If there's live conversation, this show would be even better and can even compete with the wildly successful Water World show at Universal. 9/10. One notable attraction to experience - for all the wrong reasons - is the simulator ride located at the back of the Soaring with Dragon roller coaster. Themed to a submarine ride, the simulator ride takes riders on a journey to an underwater Chinese city that is supposedly related to Anhui history or something like that. The ride, however, is far from engaging and mesmerizing, as it's boring extremely boring. The experience is further made worse by the non-synchronized movement of the vehicle with what's shown on the screen. By mid-ride, most guests decided to take their 3-D glasses of and just dozed off. What a disappointment. The queue is decently themed though. 2/10. The simulator ride's queue is decently themed. But the ride itself is horrible. The theme park also consists of other flat rides that are rather enjoyable but not exactly exciting or unique. I didn't get the chance to ride them all, but I'll just show you some photos for you to judge on your own. The tower swing ride similar to those you can find at Six Flags parks. A typical frisbee by Huss Park Attractions. 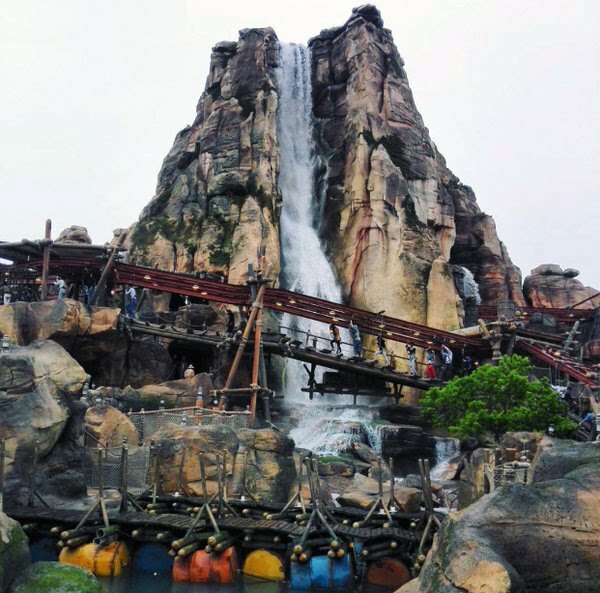 A well-themed splash boat attraction that guarantees riders a soaked-to-skin experience. Do take precaution, however, when you decide to ride the Top Spin ride. This one has a much more intense cycle than the one you find in typical thrill parks around the world. Other than long cycle, the attraction hosts apparently distribute the weight between the two sides in such way that the gondola spins upside down as many times as possible... and at the fastest speed as possible. Needless to say, this Top Spin is painful and extremely forceful to a point that you can feel the blood pulsing at the soles of your feet. 4/10. One of the most extreme Top Spins I've ever experienced. Hefei Wanda Theme Park is without doubt an ambitious project by Wang Jianlin. Even compared to the existing local player's theme park like - say - Happy Valley Shanghai, Hefei Wanda must be commended for its tremendous efforts in telling a story, which is a departure from the common misconception of theme parks in China that everything is all about size and not about immersing the guests in that same environment. I also commend the fact that Hefei Wanda has unique line-up of attractions. Soaring with Dragon and Battle of Jungle King are - while turn out to be somewhat disappointing - both unique roller coasters that can't be experienced anywhere else in the world. The show taking place at Feishui Theatre is amazing and colossal in scale, and is even comparable to the wildly popular, classic stunt show Water World at Universal theme parks. Hefei Wanda must be commended for its serious efforts in bringing storytelling to life. For Chinese standard, Hefei Wanda is also a huge improvement in terms of landscaping and theming. I might be biased because - after all - the park is still relatively brand-new when I visited (only 7 months old). But I can't disregard the fact that the park is actually pleasant: I enjoy taking a stroll around the park without feeling disturbed whatsoever. Landscaping at Hefei Wanda is outstanding. At the time this park review was published, there are two outdoor Wanda theme parks in operation: this one and another one in Nanchang, China. In the next few years, Wanda Group plans to open plenty more, although at the moment the group's website only acknowledge a total of 6 outdoor theme parks to be developed. A rock ornament at Hefei Wanda looks eerily similar to the Roaring Mountain at Shanghai Disneyland in terms of design. At the end of the day, Wang's goal boils down to one aspect: net profitability. As such, Wanda Group has to find that delicate balance between revenue and expenses. Spend too little and the customers will not be impressed by the quality of the parks. Spend too much without regards to customer preferences, and Wanda will lose money big time. Interestingly, I feel that Wanda can instead compete head-to-head with the foreign entry Six Flags, which is poised to open its own theme park in Zhejiang in the next couple of years. Comparing Hefei Wanda to a typical Six Flags theme park in the U.S., I can say that Wanda has its competitive advantage in superior theming and more pleasant general ambience throughout the park. In the U.S., this is also a competitive advantage that was Busch Gardens has. Up and down the ferris wheel we go.